Looking for a door repair company or service is a common practice amongst people of Delta, British Columbia because where there are homes, there are doors and these doors might need a fix every now and then. First and foremost, we as a company work to ensure that we provide residential door repairs. If your house has been struggling with a bad door that needs an immediate frame or lock fix, we are willing to help. 24hr Door Repair not only take down old doors and install new ones but we also fix front aluminum doors that are damaged for bad paint or any other damages. Therefore, as a company, we pride ourselves on providing every imaginable same day service that there might be for residential properties. We also provide a fast and affordable sliding door repair services, including patio or pocket door rollers or tracks. Contrarily, we also fix doors for commercial properties. 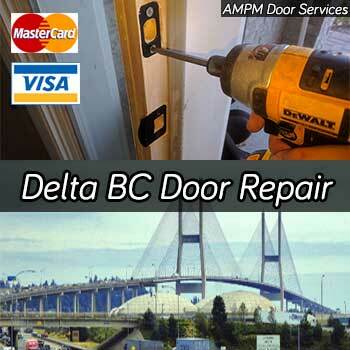 We have seen that there are a lot of commercial properties in Delta BC that might need a door repair every now and then. Commercial properties are home to both big and small doors and this is where we come in. We fix broken commercial steel doors, damaged metal door frames, replace old entry doors with new ones and work to fix doors for any paint job or other damages. Therefore, if you have a commercial property in Delta that needs a bit of a fix, we are just a call away as we have every solution for your door.